AI makes it possible to know the B2B buyer like never before and to begin to answer critical questions about what works in attracting and engaging those buyers. B2B buying is conducted by buying teams, so why do most sales teams focus on just individual buyers? Join MRP and SiriusDecisions for a conversation on how switching the focus from individuals to buying groups will improve your bottom line. During this webinar, we will highlight these common reasons why you’re not closing deals, and how to fix it. 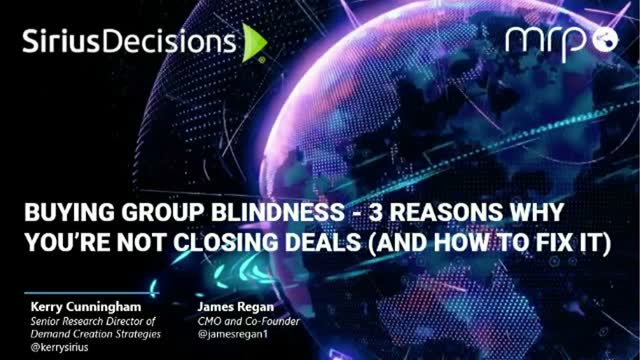 Register for this webinar and join Kerry Cunningham, Senior Research Director of Demand Creation Strategies at SiriusDecisions and Jim Regan, CMO and Co-Founder of MRP and learn how to avoid buying group blindness. Join us as Jim Regan, CMO and Co-Founder of MRP, discusses how Account Based Marketing and Predictive Analytics are converging to deliver actionable triggers that transform your customers’ experiences forever. Jim will share his perspectives on why utilizing machine learning to make predictions on prospects’ buying patterns and using those predictions to inform your content strategy has shown greater results and how to turn these insights into a scalable ABM campaign. • How MRP closes the loop on integrated ABM strategies so clients can identify and replicate high performing tactics, all on a global scale. Join our guest Steve Casey, Principal Analyst for B2B marketing at Forrester, and Jim Regan, CMO and Co-Founder at MRP, to learn why artificial intelligence and machine learning are crucial to future proofing your account based marketing strategy. ABM and AI are converging and delivering actionable triggers to transform your customers’ experiences forever. Steve and Jim will share their perspectives on why utilizing AI to make predictions on prospects’ buying patterns and using those predictions to inform content strategy has shown greater results in account-based marketing strategies. With MDF allocations continuing to increase in 2018, these issues can drastically impact the performance of your channel revenue. Register for this webinar and join Devon Wellbrock, SVP of Enterprise Accounts, Americas, MRP as she discusses how you can improve visibility and lead conversion in the channel. Inside Sales has been a critical success factor for winning B2B companies. This success has also created key challenges that can limit future scale. Join MRP and SiriusDecisions in this fast-paced live webinar as we unpack these challenges and deliver actionable insight for you to direct or redirect your efforts. Let’s face it, doing more of the same isn’t working. MRP Next Generation Inside Sales is powered by artificial intelligence and allows your team to work smarter. Our prioritized calling queue is powered by a combination of engagement data, real time intent and historical contact data. We’ll help you put an end to cold calling through for more intelligent and relevant conversations. Register for this webinar and join Kerry Cunningham, Senior Research Director of Demand Creation Strategies, SiriusDecisions and Kevin Cunningham,CEO, President and Co-Founder, MRP as they discuss where the future of inside sales is headed. Register now for this LIVE webinar! Artificial intelligence isn’t just a future concept or the latest industry buzzword. Soon enough, AI will be a non-negotiable sales and marketing tool. Artificial intelligence is currently driving real results for B2B organizations. Utilizing AI to make predictions on prospects’ buying patterns and using those predictions to inform content strategy has shown greater results in account-based marketing strategies. AI-enabled software can connect insight to the action so you can trigger personalized, relevant content at exactly the right time, in exactly the right context. Register for this webinar and join James Regan, CMO and Co-Founder, MRP and Dan Harvey, Solutions Architect, MRP as they discuss how embedded artificial intelligence and machine learning are changing the way sales and marketing teams acquire customers. The key to success for B2B marketers in today’s marketing environment is to put the right messages in front of the right accounts. Predictive analytics and account-based are two ways to make that happen. The combination of these two allows companies to focus on accounts that are most likely to buy, and to deploy customized tactics to each account. Join Mike Thyne, Senior Director of Performance Marketing for Digital River, and James Regan, CMO and co-founder at MRP, as they discuss how Digital River transformed its marketing strategy from broad-based demand generation to highly targeted account-based marketing. Artificial intelligence isn’t new. It’s been around since the 1950s. But what is new is that companies – from AI start-ups to enterprise software vendors – are adding intelligence to their applications to drive more effective customer engagement. Join our guest Steve Casey, principal analyst for B2B marketing at Forrester, and Jim Regan, CMO and co-founder at MRP, to learn what’s possible with AI now, and what will be possible in 2018 and beyond. Steve and Jim will share their perspectives on how account-based marketing, predictive analytics, and artificial intelligence are converging to transform the customer experience forever. In the modern sales and marketing landscape, enterprises face a major disconnect when scaling up to a global market. Marketers struggle to remain on the cutting-edge while still adhering to corporate standards. Salespeople are skeptical that these tactics are helping them identify true opportunity. And the wedge between them is driven deeper. How can marketing departments test new strategies while still ensuring that their efforts are aligned with their sales team counterparts? Vance Faulks, the Senior Director of Global Audience and Partner Marketing for SAP will tell you how he was able to accomplish both those things with MRP predictive analytics. The ability to predict demand and identify highly qualified opportunities has helped to align the two teams around a common goal: driving revenue. Watch On Demand this webinar and join Vance Faulks, Senior Director of Global Audience and Partner Marketing and James Regan, CMO and Co-Founder, MRP as they discuss how to align sales and marketing departments through predictive analytics. Successful customer engagement comes from knowing your customers, serving their needs, and consistently adding value to their experiences with you. Technologies like predictive analytics, machine learning, and artificial intelligence help you make better predictions, smarter decisions, and faster responses, transforming your customer’s experience from traditional to exceptional. Watch this On Demand Webinar and join James Regan, CMO and Co-Founder, MRP as he discusses how to use technology to transform the customer experience. If you’re trying to better understand what is artificial intelligence, intent data and predictive analytics, this webcast is for you. Watch this on-demand webcast and join Kerry Cunningham, Senior Research Director, Demand Creation Strategies, Sirius Decisions and James Regan, CMO and Co-Founder, MRP to learn best practices for becoming a better, smarter marketer! Register for this on-demand webinar and learn how Oracle leveraged MRP’s unique platform to provide their marketing team with the data and analytics they needed to support their sales and marketing strategies. After you attend this webinar, you’ll have a better understanding of how to create a dynamic customer engagement platform that combines best practice engagement strategies with predictive analytics data. Watch this webcast and learn about the newest member of the Demand Waterfall family and how it can help you drive demand and revenue creation performance optimization throughout your organization. MRP helps its customers make better predictions about who their next customer is, to understand where they are in the buying cycle, and how to acquire them more efficiently.